The Hook: Three roommates who are lifelong friends combat their mediocre RETAIL lives. Thoughts: What happens when you graduate from high school and don't know what to do with your life? What if you don't go to college? What if you end up in a boring, mundane RETAIL job? How do you deal with the mediocrity of life with an uncertain future? Can life-long friendships survive the changes--or lack there of--that life presents us with? 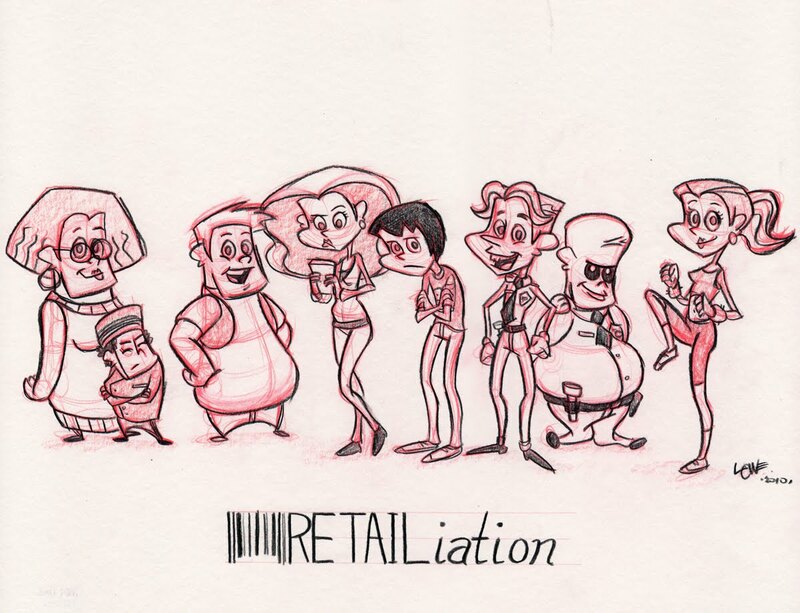 Many people view retail as being a low-tier, anyone-can-do-it kind of job. Maybe you had a retail job in high school, after school or over summer break. Maybe you worked part time during college as a means to an end. But what if you don't progress from high school and just "get stuck" at that retail job? 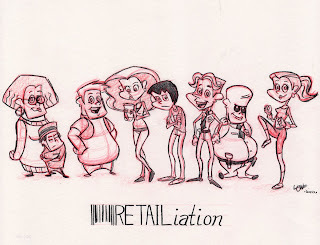 RETAILiation isn't just a retaliation against retail, as the title implies. It's a retaliation against the implied/assumed boredom that is a retail position. Also, it's funny. The Hook: Enter an Animal Kingdom akin to the Garden of Eden paradise just after Adam & Eve have eaten the forbidden fruit and had their eyes opened. Thoughts: Welcome to the Paradise that is the Land of Cutesywootseykins, where animals exist with a sort of naïvety, without hunger or any wants & needs, save the desire to live each day to it's fullest. Their world is not unlike the Garden of Eden that Adam & Eve inhabited. So what happens when, like in that story, someone takes a bite from the forbidden fruit? What happens when their perfect world is suddenly thrust into the "Circle of Life" cycle? We are able to witness the birth of the animal Food Chain that, in it's own way, unites the many lands of the Animal Kingdom. A brave few have taken it upon themselves to find out what is happening and, hopefully, save this Paradise in which they live. Can they prevent the inevitable? 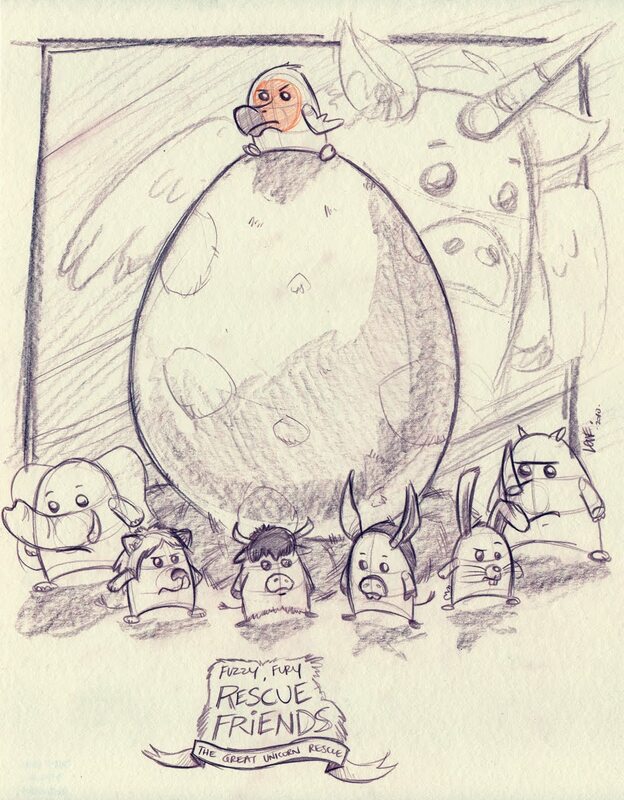 Planned as a book series, actually (though, it could be adapted into a movie series a la Harry Potter), the first storyline is titled "The Great Unicorn Rescue". 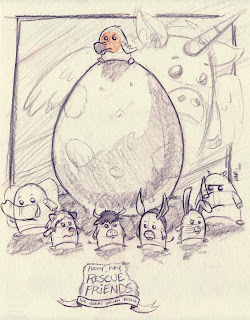 It revolves around the formation of the group as they set out to rescue the Unicorn from the clutches of The DoDo Bird! Expect a surprise plot twist at the end, though. The Hook: Boy bug likes girl bug. Other, bigger boy bug likes girl bug. Girl bug likes other, bigger boy bug. Girl bug proposes a contest to win her affection. Will everyone get what they want? 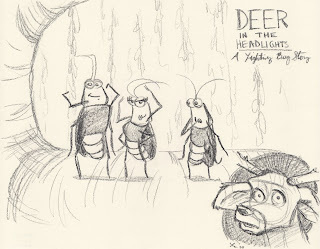 Thoughts: I've published a whole bunch of sketches and story thoughts on this over the past year or two. There's also a whole section of it, complete with fully storyboarded sequence, over at my website -->Click Here to see all that. I'm really banking on my first two ideas--which I've listed in order of desirability--so I thought I should throw in a short story idea to flesh out my three. This was just the one with the most development to it. Hopefully I'll be able to work on some of my other short story ideas in a Storyboarding class at some point. Or maybe I'll just take a dozen more Fine Arts classes...the school seems to like me in those. Anywho, those are my three ID-ers. Thoughts?